So you are thinking about moving to Bend or maybe you just plan to visit and you want to know what keeps us locals busy. 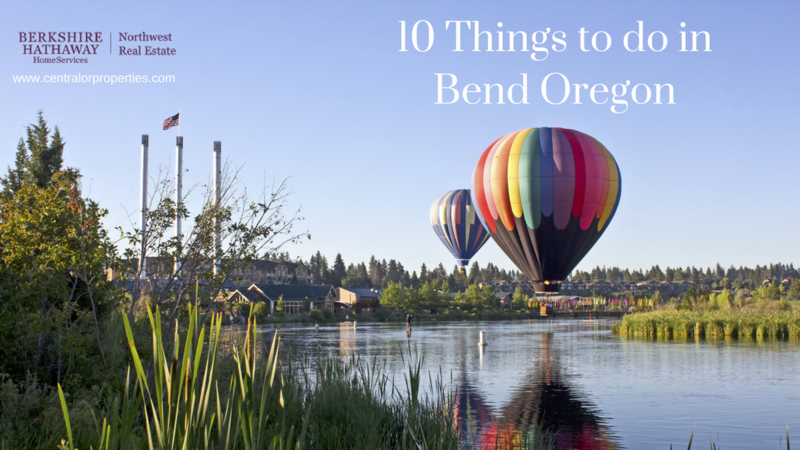 Here are ten things to do in Bend Oregon. 1) Golf - Bend is at heart a resort town and as such has plenty of golf course options from private to public to choose from. What you may not know, is many of those courses are championship level and award winning. With approximately two dozen options to choose from, you are sure to find a favorite. 4) Skiing & Snowboarding - Yup Bend has winter sports. Mt Bachelor is the 5th largest ski area in the country, and Hoodoo located near Sisters is a great family ski option. Both locations also offer a variety of summer activities so check them out. 5) Rafting & Water Sports - In spite of being in the high desert, the Bend area has many lakes, and rivers to play in. Choices range from boats to stand up paddle boards, rafts, kayaks, or even a floatie. Not sure what to pick? How about paddle board yoga or a guided raft adventure? 6) Hiking - Central Oregon offers miles of scenic hiking options and Bend is in the center of things. Check out the 2 mile Pilot Butte trail (you can also hike the road) to see a great view of Bend, or hike the Deschutes River Trail if you prefer nature. 8) Art Galleries and Museums - Bend is home to the High Desert Museum as well as some great galleries offering fine art, photography, jewelry and local made crafts at the Old Mill District or in Downtown Bend. 9) Special Events - Bend hosts a lot of events each year, you can choose from concerts, comedy, art exhibitions, farmers markets, culinary events and even a independent film festival. Whatever your taste, you are sure to find something fun to do. 10) Drink Beer - While not yet a sport or a traditional leisure time activity like shopping or the spa, drinking beer is a favorite pastime here in Bend. The city has a wide selection of Craft Breweries so here is a list of some of them courtesy of The Growler Guys. If you like Beer then Bend is for you!